Mixed Martial Arts is combination of techniques from Brazilian Jiu-Jitsu, Wrestling, Muay Thai, and Boxing. 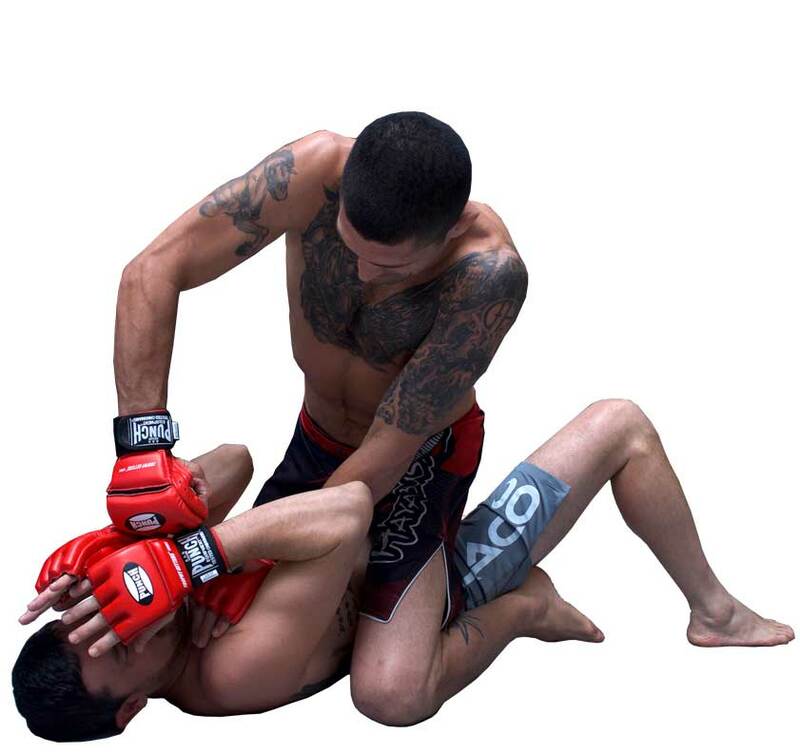 Most of the techniques learned in MMA concentrate on either striking from a standing position to taking your opponent down to the ground and keeping them there, thus enabling you to either strike or attack for submissions. 95% of street fights end up on the ground, making MMA one of the most effective real-life fighting systems on the planet. MMA is a technical martial art that not only provides students with a deeper understanding of the workings and limits of the human body, but also equips them with problem solving skills and greater body awareness. Mixed martial arts was believed to date back to the ancient Olympic Games in 648 BCE, when pankration—the martial training of Greek armies—was considered the combat sport of ancient Greece. The brutal contest combined wrestling, boxing, and street fighting. Kicking and hitting a downed opponent were allowed; only biting and eye gouging were forbidden. A match ended when one of the fighters acknowledged defeat or was rendered unconscious. In some cases, competitors died during matches. Pankration became one of the most popular events of the ancient Olympics. In 393 CE Roman emperor Theodosius I banned the Olympic Games, spelling the end of pankration as a popular sport. However, this style of fighting later resurfaced in the 20th century in Brazil via a combat sport known as vale tudo (“anything goes”). It was popularized by brothers Carlos and Hélio Gracie, who began a jujitsu school in Rio de Janeiro in 1925. Upon the emergence of the 20th century, Vale Tudo (Portuguese meaning “everything allowed”) matches throughout Brazil left a modern footprint on MMA. The scene cultivated adaptations of judo that emphasized ground fighting; namely the creation of Brazilian jiu-jitsu and later Luta Livre (Brazilian free fighting). In the Pacific Rim, Eastern and Western styles clashed head-to-head in mixed-fights known as Merikan (Japanese slang for American) while no-holds-barred fisticuffs were a regular feature at large music halls throughout Europe. England operated on the cutting edge of an MMA ideology in the form of Bartitsu, while France had long claimed home to an ancient mixture of wrestling and striking known as Brancaille. The list of early mixed martial arts was as extensive as it was widespread, touching both hemispheres. Each geographic region had its favorite, and with it the pride of its people. Whether it’s narcissism or just intrinsic curiosity, challenges that prove superiority have always defined the human race and continue to do so today. MMA first came to the attention of many in North America after the Gracie family decided to showcase its trademark Brazilian jujitsu in the United States in the 1990s. Hélio’s son Royce Gracie represented the family in a 1993 tournament in Denver, Colorado, that came to be called UFC 1. The name referred to the Ultimate Fighting Championship (UFC), an organization that became the leading promoter of MMA events. The earliest aim of the UFC events was to pit fighters of different styles against each other—such as wrestler against boxer and kickboxer against judoka. Initially, the only rules decreed no biting and no eye gouging. Bouts ended when one of the fighters submitted or one corner threw in the towel. Royce Gracie emerged as the champion of UFC 1, which was held in a caged ring at Denver’s McNichols Arena. As the UFC’s first cable television pay-per-view event, the tournament attracted 86,000 viewers. That number increased to 300,000 by the third event. Students at our MMA Gold Coast classes will learn beginner to advanced Muay Thai striking, Boxing, Brazilian Jiu Jitsu choke hold and joint lock submissions with positional techniques and ground control. Muay Thai & Brazilian Jiu Jitsu take downs to the ground are also taught. Training sessions include warm up drills and learning new techniques followed by light controlled sparing drills with a stretch to warm down. Matrix Gym MMA Gold Coast classes are designed around having fun and getting fit while learning real street self defense. You will improve your reflexes, self confidence and overall fitness while developing a strong core, improving balance, toning and building lean muscle as it uses all parts of the body. Matrix Gym offer a Mixed Martial Arts training program.